Governors Island, open weekends through September 25, is a free oasis off the tip of Manhattan that visiting families and jaded NYC locals would be wise to discover. Free is a relative term, of course. Once on the island, a former military stronghold turned national monument, you can certainly shell out for a meal and drinks and a bike rental. But with just a bit of advanced planning, you can budget the day far better than I did. Here’s what to expect. Getting there: Head down to Manhattan’s South Ferry on the M15 bus or the 1,4,5, N or R trains. To the left of the modern and colossal Staten Island Ferry terminal you’ll see a very well-preserved relic, the Battery Maritime Building. The free Governors Island Ferry leaves from here hourly from 10am to 3pm on Fridays (with the last boat returning at 5) and Saturdays and Sundays at 10am, 11am, and half hourly until 5:30; the last boat back is 7pm. There’s also ferry service from nearby Brooklyn. From Manhattan you’ll be able to board the 1,500-passenger capacity ferry about 15 minutes before sailing. Plenty of friendly, royal blue-shirted attendants are on hand to answer questions and shepherd guests through the terminal. What’s billed as a 10-minute one-way ride is barely five minutes from shore to shore, though depending on when you go – best bet is the relatively uncrowded first boat out at 10am – you’ll spend a few extra minutes loading, docking, and listening to tourists and New Yorkers all too happy to grumble about a scenic and free ride. There’s both a separate line and ferry area for passengers with strollers and bicycles, and while the island’s lovely acreage is manageable on foot, it’s smart to bring your strollers and bikes if you’ve got ’em. What to eat: There’s a bag check in the ferry terminal prior to boarding, but don’t let that dissuade you from packing food and drink for the day and picnicking on one of the island's bucolic grassy patches. The alternative is to pay handsomely for burgers and watermelon slices and the like at the Water Taxi Beach concession. I paid around $45 for my family of five's lunch, which was passable, but opening weekend kinks meant an absurdly long wait for service. One plus: Beer is on sale via a separate, shorter line, and you could do a lot worse than have your first icy draft of the summer while passing the time here. What to do: Governors Island has a storied military history. Some of the first shots in 1776’s Battle of Brooklyn, yo, were fired from canons here, and the island’s Castle Williams and Fort Jay figured into wars thereafter. And although these buildings and several 19th-century homes are pretty to look at, the draw here is the green space. There’s plenty of open air for pastoral walks, grassy hills very conducive to rolling children, and designated bike paths. If you don’t have your own bike, adult and children's bikes are available to rent in two-hour increments ($15 adult, $10 kids) or by the day ($25 adult, $20 kids). Novelty tandem and quad bikes are also available, and my brood and I paid $30 to try the latter for half an hour, which is quite enough time, especially when your little ones aren’t quite pulling their weight in the back seat. The best-kept secret on the island is the free FIGMENT Minigolf course, 14 holes festooned with insect-themed obstacles and sculptures. The course is funded by individual donations and staffed by volunteers throughout the summer. The course, in the Liggett Hall courtyard, is open Friday from 10am to 4pm, and Saturday and Sunday from 10am to 6pm. Some of the other best-kept secrets at Governors Island are the free events throughout the summer. 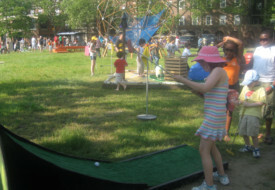 The Big Apple Circus will run circus skills workshops for families, the National Park Service will periodically hold military reenactments geared toward educating kids, and the Governors Island Alliance on July 23, beginning at 11am, will be giving away hundreds of kites. If the wind and weather cooperate, I can’t think of a better place to fly one, and if you're in town for it, I’ll see you there.